The other day, iCad pointed out on tumblr that it's boring that all townies are thin, never fat or fit - and as soon as she'd said it, it started bugging me too. 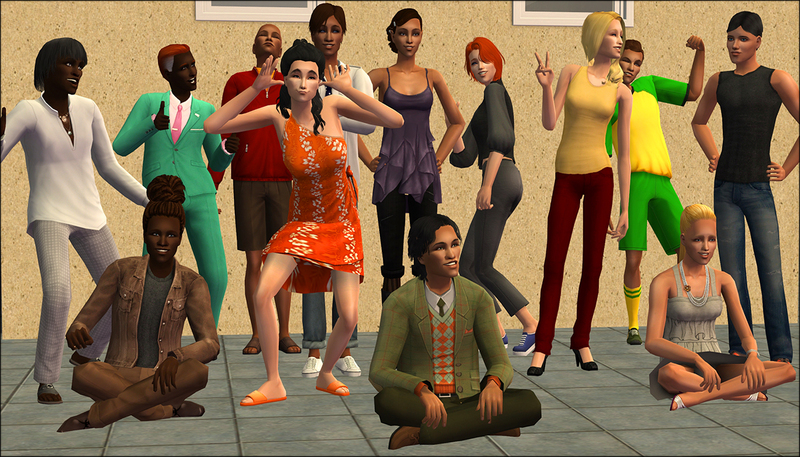 So I've made this set of mods, which will make various different types of townies spawn with a variety of body shapes - as in this illustrative group photo of the new dormies at Sim State Dormitory! With these mods installed, whenever the game makes a new townie, it will roll a die to decide whether the townie should be fat, fit or thin. Existing townies won't be affected - only new townies. TownieBodyDiversity - this affects townies, downtownies and AL social group townies. TownieBodyDiversity_Dormies - this affects dormies. TownieBodyDiversity_BVLocals - this affects locals in BV destinations (but not tourists). TownieBodyDiversity_NPCs - this affects all NPCs, e.g. cashiers, bartenders, maids, professors etc. 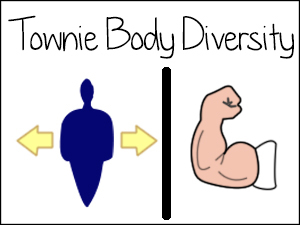 If you have Ultimate Collection, or your latest EP is AL or M&G, download Townie Body Diversity.7z. If you don't have all the EPs, I've included versions for other EP configs in the "Legacy Versions" file - pick the version for your latest EP. TownieBodyDiversity_BVLocals works for all EPs (as long as you have BV) so there is only one version of that one. Obviously, don't use the Dormies mod if you don't have Uni. I also recommend downloading this fix from Jawusa in order to prevent your fat waiters from exploding. For those who are concerned about loading times, it's safe to combine these files into one using SimPE. These mods do not conflict with notownieregen, nodormieregen or Cyjon's There Can Be Only One (Professor), and any townies/dormies/professors that are allowed to spawn by those mods will get a chance to be fat or fit. MSD, for also having this annoying problem.